I love her Nolita Print! 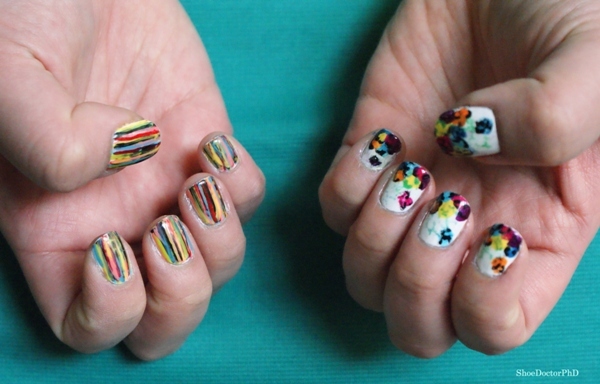 So far, the extent of my nail art design has been with a tooth pick - but these bloggers are inspiring me to take it a bit further and spend some time making a masterpiece. Do you guys have any tips for Nail Art? What are the best tools to use? Or at least the best ones to start out with? I'm open to suggestions! Oh & also.. I have all the pieces in this outfit and wondering if I should re-create it. I usually like being super creative but this ensemble just looks like a lot of fun. So you tell me! Wowzers. This girl has talent!!! LOVE the blue & black color block! I love how they got inspired by fashion! Such a great idea. I've seen that first pic before- that girl is amazing! love fun nails! the best i can do is a french mani. but luckily i found some ladies at a local salon who will do fun manicures for me - love it! I love the inspiration from the heels! And I'm kind of obsessed with those shorts! 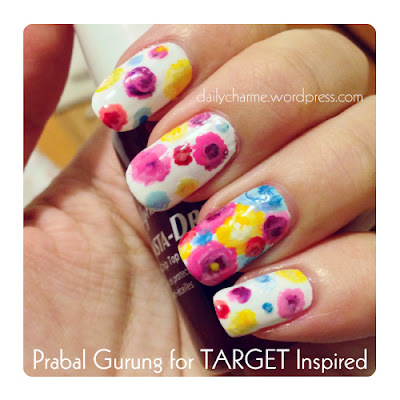 Love love love this nail design, what a fun inspiration!! !